Natural Gas Export Plan Unites Oregon Landowners Against It The natural gas industry wants to export more of its commodity, but first it has to build infrastructure. In Oregon, companies want to build a 230-mile pipeline and an export terminal on the coast. Some welcome the new jobs, but others worry about environmental consequences. 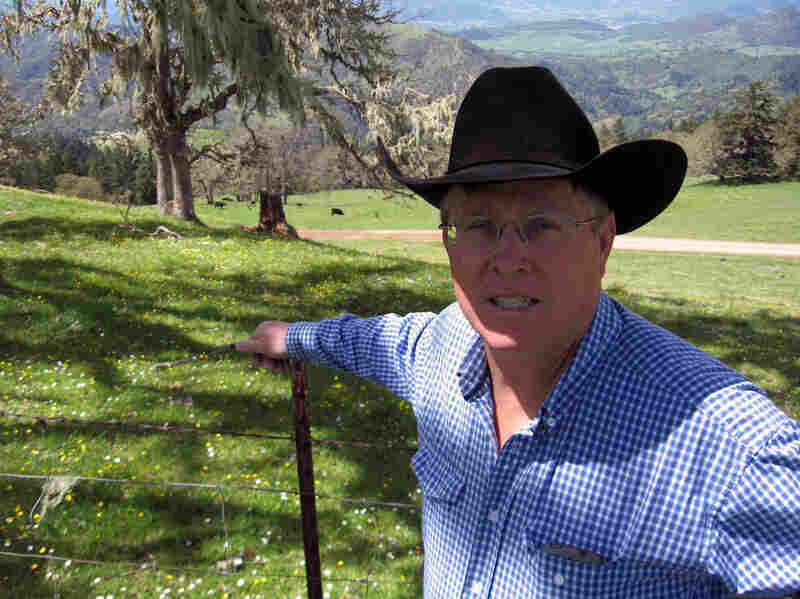 Rancher Bill Gow doesn't want the proposed Pacific Connector Gas Pipeline to travel across his Douglas County, Ore., ranch. While he has refused to negotiate with the pipeline company, ultimately a court may force him and other landowners to allow the project on their land. A radical shift in the world energy picture is raising environmental concerns in the United States. Until recently, the U.S. had been expected to import more natural gas. But now, because of controversial technologies like "fracking," drillers are producing a lot more domestic natural gas; so much that prices are down, along with industry profits. And drillers are looking overseas for new customers. Whether the United States should export some of its newly abundant supplies of natural gas is a controversial issue before the Department of Energy. About two-dozen applications have been submitted to the agency for exports to countries that don't have free-trade agreements with the U.S.
Environmentalists are concerned that exporting gas will lead to more drilling and hydraulic fracturing, or "fracking." Some chemical companies have argued against approving all of the export proposals; they want plenty of cheap natural gas here in the U.S. to fuel manufacturing. And, individually, some of the export proposals have proven controversial in the communities where companies want to build them. 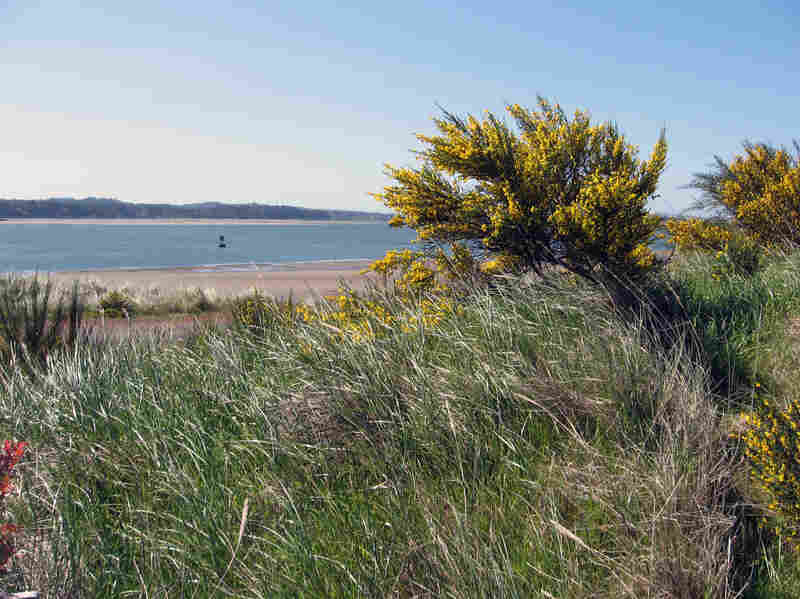 One such plan, the Jordan Cove Energy Project, would sit on the North Spit of lower Coos Bay in Oregon. About 2 miles from the Pacific Ocean, the proposed site isn't much more than sand, tall grass and shrubs now. But if all goes according to plan, there will be two huge storage tanks next to a 45-foot-deep berth for ships. Nearby, a new power plant would run the refrigeration necessary to turn natural gas into the much-easier-to-transport liquefied natural gas (LNG). The plant would process about 1 billion cubic feet of natural gas every day. That's enough to meet the daily needs of nearly 4 million American homes. But the gas wouldn't stay in the U.S.
"Our principal [markets] are the Asian countries — India, Japan, South Korea — that are strongly interested in securing LNG from the United States," says project manager Bob Braddock. If the $6 billion project is built, several thousand construction workers would be brought in and housed. After construction, the company says, there will be about 150 new jobs with wages averaging $75,000 a year. That would be a boost to a region hit hard by the decline of the timber industry. "We need more than just retired people here. We need some young people to stay in the area," says North Bend resident Angeline Pennington. She supports the project and believes it will help the local economy and young families. But others worry that more industry will affect recreation. "I like to use the bay a lot — crabbing, clamming," says Jeff Allen of Coos Bay. "Now you can go out there and do whatever you want. When they have more industry out there, you're going to have ships coming up the bay." 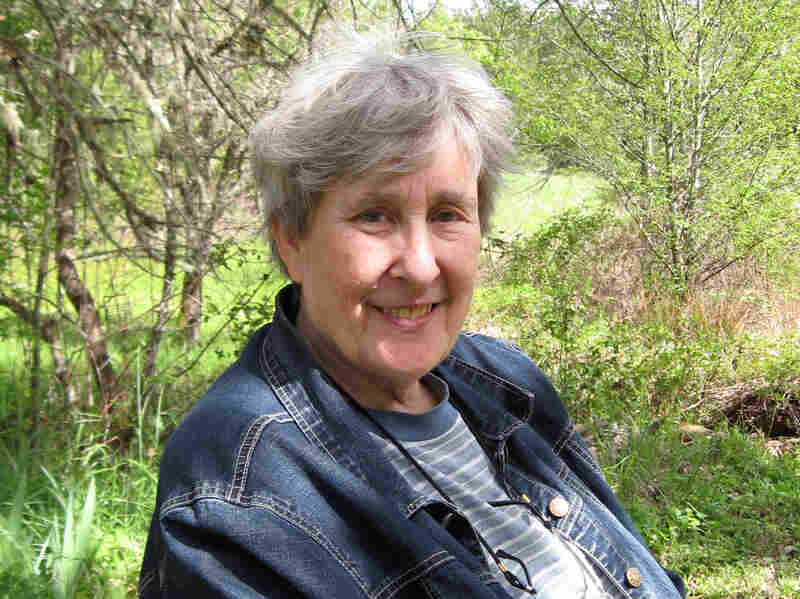 Francis Eatherington is a board member of Oregon Women's Land Trust. The group doesn't want the 230-mile Pacific Connector Gas Pipeline to travel through its property. The controversy extends beyond this coastal town. The project requires a 230-mile-long pipeline to transport gas from Malin, Ore., to the coast. The Pacific Connector Gas Pipeline would cross public and private land. The potential environmental impact of the project has some landowners worried. The Oregon Women's Land Trust owns 147 wooded acres about 100 miles away in Douglas County. The group's mission statement says it "is committed to ecologically sound preservation of land, and provides access to land and land wisdom for women." Board member Francis Eatherington says a clear-cut pipeline route through the property would make it difficult to fulfill that mission. And board Secretary Kaseja Wilder says if the pipeline is built, "there will be women who will come out here and they'll chain themselves to things and they'll lie down in front of machinery." Opposition to the pipeline has created some unusual alliances. Rancher Bill Gow says on most other issues, he'd be on the opposite side of the Oregon Women's Land Trust. But he is also opposed to this project. "They're going to put a big scar right through the middle of my ranch," Gow says. "It bothers the hell out of me, and I don't want it there." But Gow may not have a choice. Eminent domain likely will come into play, and a court could force reluctant landowners to allow the pipeline across their property, though that's not the company's preferred option. "We'd much rather come to an equitable agreement with the landowners," says Michael Hinrichs, director of public affairs for the Jordan Cove Energy Project and the Pacific Connector Gas Pipeline. He says 35 percent of the approximately 300 landowners affected have agreed to let the pipeline cross their property. He says 15 percent have refused. The site of the proposed Jordan Cove Energy liquefied natural gas export facility near Coos Bay, Ore. Proponents say it would boost the local economy, but others worry it will affect recreation. "We like when landowners engage us, because then they can negotiate and we better understand not only their land but what they feel their land is worth," Hinrichs says. Still, Gow says he will continue to oppose the pipeline and the projects. "This is to export this gas to another country," he says. "We're taking a resource that is valuable to our economy — we could create jobs in this country with — and we're shipping it overseas." The Department of Energy considered issues like this in approving a similar project in Freeport, Texas. The department concluded that it would likely "yield net economic benefits to the United States." Backers of the Oregon project hope to begin construction next year and have the pipeline and the export terminal operating by the end of 2018.